Hey all, This is my first post here, but I've been lurking for quite a while as a guest. Received a lot of good info that has saved me thousands... Hoping to continue that tradition right now. 2000 Ford Ranger 3.0 2WD Manual (10/99 production date) has a rough idle, loss of power, pretty constant thick white exhaust with water coming out of the tailpipe. Here's the scoop... I started having a rough idle a few weeks back. Went away, and I thought nothing of it. A week and a half ago it came back, and stayed. After copious amounts of reading and testing, I diagnosed that the "most likely" scenario was a blown head gasket after replacing the fuel filter, plugs, wires, and doing a couple rounds of the PM-3 carburetor tune up cleaner with subsequent oil changes. When I disassembled the top of the engine, nothing seemed out of the ordinary until I removed the cylinder heads. There was coolant in every cylinder of the engine block. Found that odd due to all of the reading I did. Seemed like others with similar problems had one, maybe a couple of cylinders with coolant in them which steamed the tops of the pistons clean. Didn't happen with mine. None of the pistons were "steamed clean." Anyways, cleaned everything as best as I could of coolant and went on with it. Got remanufactured heads, and a FEL-PRO head gasket kit. Cleaned the block of all old material, and it wasn't warped. Couldn't see any cracks in the block when I had it in pieces, but I don't know what else it could be. Any ideas? How would coolant get into every cylinder? If the engine (or cylinder head/head gasket, for that matter) had a crack in it, wouldn't it only be in one cylinder? Going to test compression rates of the cylinders tomorrow... I'll get back with the info, but hopefully someone out there knows what's up, and can help. Thanks for reading that wall o' text. Anyone? I'm lost. Don't know what to do next. Change the engine block? Is there some other place coolant could be leaking into the cylinders from? I'd probably cry if I changed the block, and the problem was still happening. Please help. Having coolant in all cyl's when you removed the heads isn't something to worry about. If the coolant level was higher than the heads when you pulled them, that's where it went. As for still getting white smoke, still maybe nothing to worry about, if coolant was in the exhaust system, it will take awhile to burn it out. As for the rough idle, I don't know. I'm going to drive it for a week or so just to see if it is a residual thing... Doesn't strike me like that, though. I would also be surprised if it is a cracked engine block. I mean with my symptoms, the engine would have to be cracked in all cylinders, then it wouldn't run at all. Bare in mind that when I took the heads off, the top of every piston had carbon on them. None of them were really "steamed clean." Next time do a combustion test first? Where did you buy your heads? I need a pair? Hopefully this can help others, so I'll put my idiocy on display for your enjoyment. I had only hand tightened the fitting going into the bottom of the EGR last night. When warming it up to test it again this morning, I suddenly remembered it. Tightened the fitting, and the rough idle is gone. THANK THE LAAAWD! As for the white smoke, hopefully it is just a residual thing and goes away through this tank of fuel. Thanks for all your help Ford Ranger Forum! I couldn't have made this fix without your help. YOU ROCK! That's great! Do you mind telling me where you got the heads and the price? Last edited by modelageek; 03-03-2014 at 06:05 AM. I did not do the fuel pressure check... Good advice. Luckily I didn't need it. I got the cylinder heads at a local machine shop that does swaps. $150 each. Maybe they ship? I drove there and picked them up in Portland, OR. I'm in Vancouver, WA. They were the cheapest place that did full rebuilds. I didn't want to take any chances. Cool group of guys in the shop, too. Well, got ahead of myself again. Took my wife to lunch and found out after restarting my truck that the rough idle is back... Sort of. It is running rough, but not as rough as it was before the head gasket replacement, and now it has become an intermittent situation. Comes on rough, then goes good again at some point while driving, and stays good. A roller coaster of emotions to say the least. Luckily (?) my check engine light came on while coming back from lunch. So I took it in and had them run the codes. Misfire cylinder 1, and running too lean cylinder 1 and 2. Fuel injectors are on their way. The guy at the store thinks that both problems happened at the same time, or within days of each other before the head gasket rebuild. Makes sense due to the white smoke remaining, and no coolant in the oil anymore. Like I said, hopefully this helps someone in the future, but this is the first I've heard of a head gasket, and fuel injector going bad within days of each other. Scared me to think I did all of that work and the engine block would need to be replaced anyways. Could still be the situation, so I'll report back tomorrow after the fuel injectors come in, and I replace them. 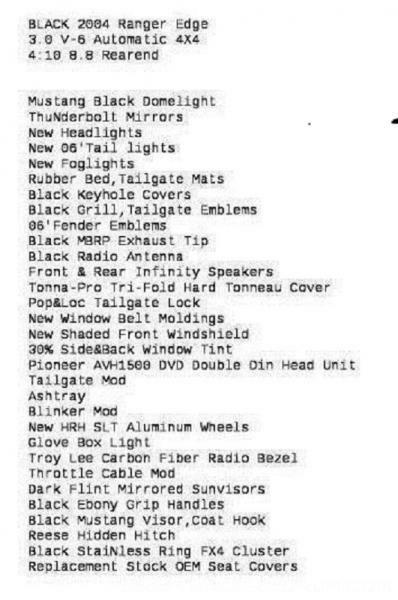 2) Are trying to sell you parts. There are a few that do know what they are talking about but I would tread lightly. -Have you done a compression check on #1? -You can get to the #1 injector easily. You can just swap the #1 and #2 injectors to see if the misfire travels to #2. -at this point you should get your own code reader. Last edited by modelageek; 03-02-2014 at 02:19 PM. Those were the codes they checked. These guys (O'Reilly's) aren't trying to sell me anything. I've talked to them in the past, and they know I only get OEM parts. I was just dropping off the fan clutch tool kit, and had them check the codes. I'm going to change the 1, 2, and 3 cylinder fuel injectors, reset the codes and restart. If that doesn't work, I'm taking it to Ford to have a professional diagnosis done. Any other ideas are greatly appreciated, though. Keep 'em coming. I beg to differ but if O'Reilys sold you 3 injectors they don't know what they are doing. If Oriellys suggested you go to Ford to buy 3 oem injectors they knew you were wasting your time and money. I already told you how to DX it correctly. I guarantee you the #2 and #3 injectors are fine. Bring the injectors back and buy an innova scanner. At least that is not a waste of money. Do what i suggested and report back. You can do my suggestions in 45 minutes and $10. That is less time then one of these trips to one store. -new plug(maybe you got a bad plug). -clean maf and air intake. -compression test #1 if needed. -buy your own reader/scanner and keep checking codes and vacuum leak. Last edited by modelageek; 03-03-2014 at 04:28 AM. Try changing gas stations,maybe their thinning their gas with water. O'Reilly's didn't sell me any injectors. They didn't even ask to, nor did they suggest I do anything, at all. They simply read the codes for me. I had Baxter's order remanufactured OEM injectors before anyone gave me any advice at either store. When people give me absolutisms, I tend to disregard their information. This is a complex issue that could end up having a lot of different solutions. From what I've read, there are lots of these issues with this exact engine, all of which require(d) different fixes. I understand that you feel you are very educated on this situation, but there are several things you've said to me that throw up red flags as to your competence on what my specific problem is. For example: Why would I check the compression, if this is an intermittent problem? I did not put any "stop leak" stuff in the radiator, and I just replaced the head gasket coupled with new cylinder heads. Does it make sense why I think that is a terrible idea to check compression at this point? Secondarily, if this was a spark plug/spark plug wire problem, how could it be intermittent? If the spark plug is broken, it's broken, same with the cracked engine block. Those are not things that come and go. Once they are bad, they stay bad. IMO, this is a situation that is dealing with electronic lapses, or a mechanical system that is directly affected by electronics like fuel injectors, the distributor, or a sensor. That being said, nobody has a definitive answer on this issue, but my gut feeling is that it is a gummy injector that frees itself up after getting warm, or a sensor on it's way out. Does that make sense? This morning I drove the truck for about 100 miles in city traffic so I could get several runs through the RPMs. I started it up, let it warm up, then took it out. When I started it for the first time, the idle was rough, and there was white smoke. When I got in the truck and drove it a block, the situation stopped completely. No white smoke, no rough idle, and continued that way throughout the entire trip. It didn't stumble once. I turned the truck off a couple of times to see what would happen... Didn't change. Ran great after start up, and the entire 100 miles. I read just about every entry into this discussion page on this issue. Several people having the exact same problem I have. This particular page/post was the only suggestion that seemed like a good thing to check. Check under "Casey" about 6 posts down. I apologize if linking other forums is against the rules. He/she ended up changing the differential pressure feedback EGR and that cured their problem... So I'm going to replace the DPFE, the EGR valve, and the PCV valve when I replace the #1 and #2 injectors. Then clear the codes, and restart... Then I'll report back. If that doesn't clear the problem up, I will check the fuel pressure (fuel pump), but I'll let the Ford dealership handle that, because I'd like them to dig deeper into what is causing this. If it is an electrical issue, I'm definitely not qualified. Interesting that you'd ask this... I make my own fuel (ethanol) most of the time. However, right now I'm in school, and have been running supreme gasoline in it for a couple weeks to spare me some time. For this discussion to proceed, we must assume your homebrewed fuel is equivalent to E85 and your Flex Fuel sensor is working properly. Anyway, P0171 indicates Cyls 1,2,3 are running lean. P0174 indicates that Cyls 4,5,6 are running lean. Your whole engine is running lean, this is not a Cyl#1 issue, Cyl#1 just happens to be the first to be affected enough to pop a code (P0301). The factory troubleshooting guide for P0301 says not to do anything about this if accompanied by either of the other 2. So in short, deal with the P0171 & P0174 first, then if the P0301 remains, deal with it . The most common cause for a P0171 & P0174 to be triggered at the same time is a vacuum leak. Guess what? a vacuum leak causes an engine to run rough at idle an usually smooth at higher revs. Another possibility for the leanness is that the engine is burning a mixture of residual ethanol left in the tank and gasoline. This could confuse the computer via the flex fuel sensor that can't make it's mind up (mapping for ethanol but consuming mostly gasoline or the other way around). That would also explain the intermittency of it too. You might find it will slowly clear itself up with each tank of fuel that is the same as the last tank. 2003 3.0l flex fuel edge Ranger. 2002 4.0 Eddie Bower Explorer. Last edited by sh8zen; 03-03-2014 at 01:48 PM.